I had been using my trusty rice cooker to make Spanish rice, but it always came out a little soft, even when I used less water. My friend Trudi shared her recipe, and I incorporated a few other things from a few of the 346,000 recipes online. Trudi will be thrilled to know that *Trudi is right. * You cannot make Spanish Rice in a rice cooker. I used her admirable technique and her suggestion to add a can of black beans. And then I added some jalapeno peppers spices for kick, and a can corn to balance it out. Two thumbs up from the kids and the leftovers can be used for homemade nachos, or as vegetarian filling for Nearly Chicken-less Enchiladas. Drizzle olive oil in a large non-stick frying pan, add uncooked rice and brown the rice. Add garlic, jalapeno and onions and a bit of butter. Continue to brown the rice, and cook the onions until they are soft. Add spices, diced tomatoes, water and corn. Stir and bring to a full boil. Turn the heat down to simmer/low and cover the pan. Let it sit for about 30 minutes. Stir occasionally. 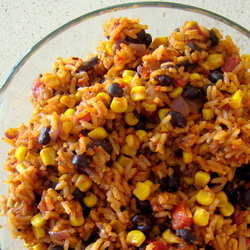 When all of the liquid has been absorbed and the rice has a soft/fluffy texture, add the black beans and mix lightly. Turn up the heat a bit, stir a bit more, letting some of the rice get brown and crunchy.